This movie is one of the more interesting Marvel animation productions I have been able to find. Not only does only one major Marvel character play an important role in the movie, but it also has cameos of a character I have only ever seen once. It also introduces completely new characters to those who have not read this storyline. The story is one that many Hulk fans have thought of before. After some unexplained disaster caused by the Hulk, the Illuminati (composed of Iron Man, Mr. Fantastic, Doctor Strange and Professor X) put the Hulk into space and send him off to a distant and uninhabited planet where he won’t cause any more harm, nor will he have people trying to harm him. Things go wrong however when the hulk attempts to break his bonds and ends up being taken as a gladiator. 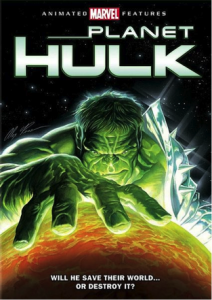 Together with a group of other slaves the Hulk must fight for his freedom and eventually come to be seen as the hero earth never appreciated. What makes this film work is that unlike every other incarnation of the Hulk I have ever seen he is not limited to “HULK SMASH” or “HULK IS STRONGEST THERE IS.” Instead Rick Wasserman is given every opportunity to play the Hulk as intelligent. In the beginning he realizes how hopeless his situation is and his only goal is survival. Eventually however he discovers a new home on Sakaar and rises up to be the saviour of the entire planet and all its varied races. Also of interest that never in this movie does the Hulk return to the form of Bruce Banner. While strange it does allow the viewer more time to be with and sympathize with the Hulk character without distraction. In the end this movie is a nice animated movie that fans of Marvel and their works will definitely want to go see. 8/10 is my final rating. To find search Hulk on Netflix.